This is where you will find the coupon codes and giveaways for specials and the daily deal Items! Free Gift On All Orders Over $20! If you have a request for the gift email if not the Goddess will guide our hands. Back to school can be an expensive time! With new clothes, shoes, and school supplies to be bought, one's magickal supplies budget can get a little squeezed out! But we at Raven's Mist want to help you save a few dollars. 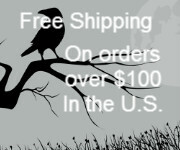 Between now and September 15, with the coupon code "school" you can save 20% off your order at www.ravensmist.com.